The Sports (And Teams) Whose Fans Made The Fewest Grammatical Mistakes In 2015 : The Two-Way The most language errors came from fans of the Washington Redskins, whose 16.5 mistakes per 100 words widely surpassed every other franchise. Fans of NBA teams did well. Fans of the Memphis Grizzlies, seen here celebrating with Jeff Green, made only 2.47 grammar mistakes for every 100 words according to a new study. 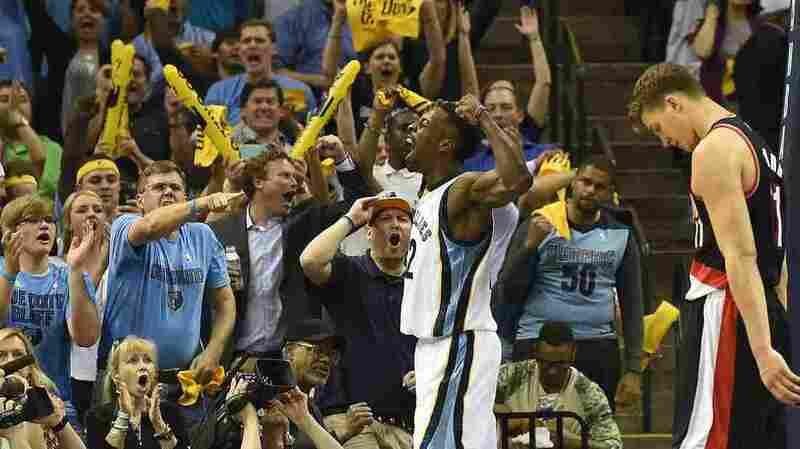 Fans of the Memphis Grizzlies can exult, after ranking first in a new national study. And there's a good chance they'll spell "exult" correctly: The team's fans were found to make the fewest grammatical mistakes in a review of comments about three of America's major sports. NBA fans made the fewest mistakes, with NFL fans making the most. And while MLB fans were in the middle, a poor showing by the Philadelphia Phillies' followers was blamed for the city's fall from fifth to 24th place in the rankings of 42 cities with major sports teams. The 2015 Grammar Power Rankings come from Grammarly, the auto-correcting app, which collected and reviewed 100 comments from the teams' official websites, as well as sports sites such as SBNation. The survey does not include the NHL or MLS. Among cities, the rankings give No. 1 Memphis a particular reason to brag over No. 42 Nashville, whose fans were judged to be the least reliable users of the English language. While Memphis fans made only an average of 2.47 mistakes for every 100 words they wrote, their Nashvillian peers committed more than 11 errors. Among individual teams, the most errors came from fans of the Washington Redskins, whose rate of 16.5 mistakes per 100 words was unrivaled. No other team surpassed 14 mistakes per 100 words in Grammarly's review. But perhaps that proclivity for errors is catching: Instead of calling Washington's baseball team by its correct name, the Nationals, Grammarly wrote the name as "Nations" in an early news release about the study. We don't mention that to be snarky. Rather, it reminds us that grammar, and the mechanics of typing, humble us all (including your correspondent). When we asked Grammarly where fans could improve their grammar game, analyst Michael Mager responded, "The most common errors tended to be punctuation. In particular, the comma tends to be misused the most." Archrivals Boston and New York tied at No. 31. Sacramento, San Antonio, and Orlando — like Memphis, cities that have an NBA team but no NFL or MLB franchise — rounded out the top four. In Milwaukee, Bucks fans had the fewest errors, with 2.43 per 100 words. But Brewers fans had more than twice that many, so the city ranked fifth nationally. The full results are at the bottom of this post. If you're wondering about the criteria, it seems that conscientious users of the serial comma can, as usual, simmer in their own rage. "For the purposes of this study, we counted only black-and-white mistakes such as misspellings, wrong and missing punctuation, misused or missing words, and subject-verb disagreement. We ignored stylistic variations such as the use of common slang words, team and player nicknames, serial comma usage, and the use of numerals instead of spelled-out numbers. "Finally, we calculated the average number of mistakes per one hundred words by dividing the total word count of the comments by the total number of mistakes for each team."